It is a Mo’edim: Appointed time, a rehearsal. Like historical plays and re-enactments. Leviticus 16 tells us all about the most mysterious and most crucial, annual 24 hour period in Hebraic History; Yom Kippur, the Day of Atonements, the day of national atonement for Israel. Yom Kippur translates to, “Day of Atonements or Coverings.” It is also called, “The Sabbaths of Sabbaths,” because it is the most important High Holy Day on the Hebrew Calendar. For every High Holy Day is regarded as a weekly Sabbath (Lev. 23). It is also simply called, “The Day” and we see this referenced idiomatically in a passage in the Brit Chadasha (New Testament). Ironic: English word Atonement : “At-One-ment,” at one with God. This is also synonymous with the prophetic apocalyptic Day of Judgment; that the final Judgment will take place on Yom Kippur. 5 Mortifications: To die to. This is the traditional Jewish understanding of affliction of the soul during Yom Kippur. Life over Law: If one has a medical condition which fasting would cause harm the Rabbi’s tell us that it is sin if that person does not eat. To save a life the Talmud says one may even eat something treif! Fasting: Science has shown a 24 hour fast once a year decreases the risk of contracting certain diseases such as cancer. Girls below the age of 12 and boys below the age of 13 are not required to fast. 2) No Washing - During the fast, one may not wash for pleasure. If one is dirty, one is permitted to wash away the dirt. Upon rising in the morning and after using the bathroom. One may wash one's hands when preparing food. 3) No Anointing - It is forbidden to anoint oneself with oil, thus the use of perfumes, make-up, suntan lotion, and other such items is prohibited. 4) No Wearing Leather Shoes - During the fast it is forbidden to wear leather shoes; because leather was seen as a comfort and luxury in ancient times. Some people wear only socks, but others wear shoes of canvas or other non-leather materials. 2-4) The point being no pampering yourself or display of wealth. This is a way of outwardly making everyone equal, so there is no outward distinction of classes within the community. Everyone is the same. Matt. 6:16-18 Moreover when ye fast, be not, as the hypocrites, of a sad countenance: for they disfigure their faces, that they may appear unto men to fast. Verily I say unto you, They have their reward. But thou, when thou fastest, anoint thine head, and wash thy face; That thou appear not unto men to fast, but unto thy Father which is in secret: and thy Father, which seeth in secret, shall reward thee openly. If everyone participates it is not to show off. 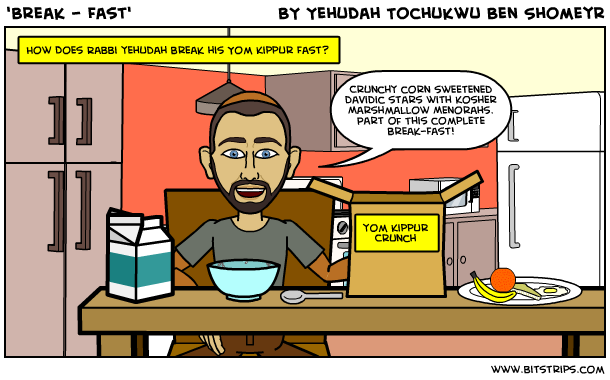 Seeing as it is Yom Kippur it is well known that everyone is fasting. So the stipulations in this verse are not in context and therefore do not apply. We are to be intimate with ADONAI at this time and not our spouse, for our spouse also needs to focus on their intimacy with ADONAI. Month before Tishri, the Month of Elul: Is focused on repentance. Ex. 20:1-12 – Commandments 1-5 Deals with man’s relationship with ADONAI. The individual repents and seeks forgiveness and reconciliation with God. Sundown (Rosh HaShannah) Tishrei 1- Sundown Tishrei 10: Seek forgiveness and reconciliation between them and their fellow man. Ex. 20:12-17 – Commandments 5-10 Deal with man’s relationship with man. Sundown Tishrei 10- Sundown Tishrei 11 – Implementation of the 5 Mortifications spoken of above. Reviewing all that was done personally during the Month of Elul and the 10 Days of Awe. Lev. 16:31 It shall be a sabbath of rest unto you, and ye shall afflict your souls, by a statute for ever. - But the Torah seems to contradict Itself. How can one be afflicted and rest simultaneously? - We afflict ourselves because it is commanded. - We can do this restfully because we have the God given time to do so. Also, we rest in the assurance that having done this in obedience that we are sealed in the Sefer Chaim (Book of Life) for another year. - If you take full advantage of the Month of Elul and the 10 Days of Awe you can rest and have no need of worry on the Day of Atonements. - The affliction becomes a joy because you know all you needed to do was accomplished during Elul and the 10 Days of Awe and you can fully focus on celebrating and thus you will even notice the afflictions we are commanded to put ourselves under. This is perhaps one of the most mysterious and misunderstood priestly offices in Scripture; so much so that cults have been created based on their views and interpretations on this priesthood. The personage of Melchezidek has been confused with everyone from Yeshua to Michael the Archangel to Shem, son of Noah. It is my opinion, taking the whole of Scripture, Rabbinic Literature and Extra Biblical Texts into account that Melchezidek is Shem, Noah’s son. The only reason I bring Melchezidek up is because Yeshua, not being a Levite, but a descendant of Judah cannot be a Levitical Priest but according to prophecies in the Tanak and passages in the Brit Chadasha that Yeshua is the Priest after the order of Melchezidek which supersedes the Levitical Priesthood but does not do away with it. Many feel this is what the Christian world terms a “Christophany” which is a physical manifestation of Yeshua the Messiah in pre-incarnate form. This very well may be true, but the text seems to indicate that Melchizedek was a real person. His name means King of Righteousness, and he was king over Salem, what is now known as Jerusalem, City of Peace. He could have been a relative of Shem, who according to Jewish tradition Shem was appointed the family priest after Noah and his sons departed from the ark. - Yeshua was from Judah, yet genealogy implies because Miriam (Mary) was Elisabeth’s cousin, that she had some Levitical blood in her as well as Judean, and Yosef (Joseph) was Judean. - Yeshua ultimately is a Priest of the Melchezideckian order, which is a higher and older order of Priesthood that does not negate the Levitical Priesthood. One day during Messiah’s reign Yeshua, the Priest of the order of Melchezidek will supervise the Levitical Priesthood in the 3rd Temple. - As we just said, Shem, Noah’s son was the first Melchezideckian Priest. Ex. 19:6; Hebrews 10:19- We are a nation of Priests going through Yeshua the Melchezideckian Priest higher than the Levitical Priesthood. Lev. 16:3-6 – Aaron had to first perform a sacrifice for himself before he could perform the sacrifice of Yom Kippur on behalf of the Nation of Israel. Hebrews 7:22-28 – Yeshua Melchezideckian Priest needed no sacrifice for Himself. I believe Yeshua Ha Moshiach of the Branch is the prophesied Messiah of Israel. That He was FULLY ADONAI to be able to redeem us from our sins, and FULLY man to have the right to redeem us from our sins, to be our Kinsmen Redeemer (Ruth, Jer.17:5-7, Jn.1). Yeshua is the perfect, holy, sinless Messiah, the figurative Son of ADONAI, who is the Word that became flesh dwelt among us (Jn.1:14) who came to dwell in a mortal body that never saw corruption (Ps.14:10), a pure deity manifest in the flesh. He was not an incarnation, which would denote that 100% of ADONAI came in the flesh. Yeshua was FULLY ADONAI in the flesh, but not 100% ADONAI. ADONAI is so infinite that He is everywhere and fills everything, so it would be impossible for ALL of ADONAI to be limited to a mortal body. In the words of Dr. Friedman, “If we were to go to the Mediterranean Sea and fill a glass with sea water, we can say that all the water in the glass is truly sea water. However we cannot call the glass, “The Mediterranean Sea.” There is much more to the Mediterranean Sea than the glass. Yet nonetheless, the water in that glass is truly Mediterranean Sea water through and through.” I believe that Yeshua is the Kohen Ha Gadol (High priest) who became the ultimate, once and for all atoning sacrifice Himself, for all mankind (Heb.4:14-5:10; 6:19-8:2). I believe salvation is only available through Him. I believe Yeshua came first as Messiah ben Yosef (Joseph) the Suffering Servant, and will be returning as Messiah ben David the Kingly Messiah. I believe that these two pictures of the Messiah, given in Scripture are one and the same. - Stayed up all night with other priests reading Torah to him to keep himself pure in thought and spirit prior to the Yom Kippur sacrifice. - Yeshua perfect and sinless. · 10 inches squared (hand span) attached by gold rings to the ephod. · 12 different precious stones with the names of the tribes of Israel inscribed on them. The 12 tribes were to be on the priests heart at all times. · Also contained the mysterious Urim and Thummim used to make decisions. The ephod represents G-d’s hand with all the names of Israel inscribes on His hand and only He knows the destiny and path for all of Israel. Isa. 49:16 Behold, I have graven thee upon the palms of my hands; thy walls are continually before me. · The Ephod was made up of gold, blue, scarlet, purple wool linen blend which this material blend is forbidden for non priest to ware (Deut. 22:11). · It was attached at the shoulders by 2 onyx stones with 12 tribes; One priesthood with the weight of the entire nation of his shoulders. · Gold rings on the side to attach it to the breastplate. · To symbolically separate the sexual organs and urges from the head and heart. · Made of the same material as the Ephod. · Seamless Garment made of Techelit, the blue we are commanded to put in our Tzitzit (fringes) that we were on the 4 corners of our garments. · Alternating Golden Bells and Pomegranates attached to the bottom hem. · Reinforcing hem around the collar. · The tunic was embroidered, made of fine linen like wedding garment; the priests were symbolically married to YHWH. · The Gold Frontlet Plate was engraved with “Kadosh ADONAI” (Holy to YHWH). It was like Tefillin to be a constant sober reminder of their sacred duties. · It was a doubled fine linen apron which comes to the knees. · Embroidered with the precious stones set in it. Yeshua represented the High Priest and both goats. Exd. 29:11 And thou shalt kill the bullock before the LORD, by the door of the tabernacle of the congregation. Lev. 9:7 And Moses said unto Aaron, Go unto the altar, and offer thy sin offering, and thy burnt offering, and make an atonement for thyself, and for the people: and offer the offering of the people, and make an atonement for them; as the LORD commanded. - Now we see that Yeshua was sinless, He kept the Torah perfectly (Matt. 5, I John 3:4) thus He needed no bulls blood (Heb. 7:27-28; 9:12) in that yet He was human in that He could relate to our suffering because of His own (Heb. 4:15; 5:2). - Now the casting of lots during Tabernacle times it is said was done by use of the Urim and Thummim (Exd. 28:30). Even though Yeshua was sacrificed during Passover, it its interesting that the element of casting lots was used to choose between Yeshua and Barabas (Mat. 27:35). It is said the scapegoat or Azazel would be led to the wilderness thrown over a cliff, in this way Yeshua represents both the goat designated “for the L-rd,” and the scapegoat. One of the he-goats was the National sin offering, the Azazel would become the bearer of all the peoples sins. Now Yeshua was led out into the wilderness to be tempted to sin and was even tempted to cast Himself down from a high place (Matt. 4:1-11).Also at one point the people wanted to toss Yeshua off a cliff but His time was not yet to be the sin bearer of the people (Luke 4:16-30). Scapegoat; Definition: In modern vernacular a scapegoat is someone that is chosen that is blamed for the problems that a group had brought upon themselves and that person becomes the brunt of all the repercussions that comes with the blame. Usually a scapegoat is unwilling to receive punishment of the guilt of the accusations. The scapegoat (animal and human) is clueless of his fate until it’s too late. - In Yeshua we see that the blame of us all was laid upon Him and He was chosen by the people and yet it was a result of fate via prophecy. Mark 15:7-15 And there was [one] named Barabbas, [which lay] bound with them that had made insurrection with him, who had committed murder in the insurrection. And the multitude crying aloud began to desire [him to do] as he had ever done unto them. But Pilate answered them, saying, Will ye that I release unto you the King of the Jews? For he knew that the chief priests had delivered him for envy. But the chief priests moved the people, that he should rather release Barabbas unto them. And Pilate answered and said again unto them, What will ye then that I shall do [unto him] whom ye call the King of the Jews? And they cried out again, Crucify him. Then Pilate said unto them, Why, what evil hath he done? And they cried out the more exceedingly, Crucify him. And [so] Pilate, willing to content the people, released Barabbas unto them, and delivered Jesus, when he had scourged [him], to be crucified. Yeshua had trepidation about being the scapegoat yet He became it willingly. Matt 26:39 And he went a little further, and fell on his face, and prayed, saying, O my Father, if it be possible, let this cup pass from me: nevertheless not as I will, but as thou wilt. - The two goats represent the duel nature of Messiah being 100% sinless and divine to be able to redeem us, like the goat chosen for the Lord to be sacrificed and 100% human to have the right to be our scapegoat. - We also see in the two goats that the first covered our sins and the second carried them away and died with them. This is exactly what Yeshua did, covered and took away our sins for Good (Heb. 10). Isa. 53:11 He shall see of the travail of his soul, and shall be satisfied: by his knowledge shall my righteous servant justify many; for he shall bear their iniquities. Who being the brightness of his glory, and the express image of his person, and upholding all things by the word of his power, when he had by himself purged our sins, sat down on the right hand of the Majesty on high…Wherefore in all things it behoved him to be made like unto his brethren, that he might be a merciful and faithful high priest in things pertaining to God, to make reconciliation for the sins of the people….So Christ was once offered to bear the sins of many; and unto them that look for him shall he appear the second time without sin unto salvation….By the which will we are sanctified through the offering of the body of Jesus Christ once for all (Heb. 1:3, 2:17, 9:28, 10:10). The ritual of the scapegoat may also be a remez (hint) to the final demise of satan, the father of sin and lies, also the one humanity blames for their troubles. He too will be cast down from a cliff like place. Rev. 20:10 And the devil that deceived them was cast into the lake of fire and brimstone, where the beast and the false prophet [are], and shall be tormented day and night for ever and ever. - Mikvah (Baptism): Ritual immersion and don special garments. In the Tabernacle/Temple setting the veil with the angels on it (Exd. 26:31-37) symbolizes the door to the Throne Room of ADONAI on earth. The Ark is His Throne, the Cherubim on the Mercy Seat His guards and His Presence rests between them (Exd. 25:22). Thus the whole Tabernacle/Temple is symbolic of His Palace on earth. - Tommy Tenny in his book the God Chasers (Pages 57-58) goes into great detail about how the High Priest needed the buffer of incense so as not to die and to perform the necessary procedures for Yom Kippur. This just emphasizes even more that the blood of animal sacrifices is insufficient because the High Priest is already covered with bulls blood and yet an additional covering of smoke is required for the Kohen HaGadol to go beyond the curtain into the Throne Room of the King, ADONAI Almighty! - East is the direction of the sun rise and the return of the Son, Yeshua the Messiah, it’s also the direction in which we pray in the Diaspora because it faces Jerusalem and the Holy Temple Mount. - Seven is the number of the seven days of the creation week and therefore symbolizes completion and absolution. This mind you is only for the sins of the Priest and his family. - Now he performs essentially the same procedure with the goat’s blood for the sins of the nation of Israel. - After the “ransom of blood” is made in the Holy of Holies the blood of both animals are taken to the Brazen Altar in the Temple courtyard upon the four horns, representing the four corners of the camp. Then, just as he sprinkled the blood in the Holy of Holies, he does so at the Brazen Altar presumably in the same direction as the in the inner sanctum. - Now we see the specific-ness of the scapegoat ritual mentioned earlier and the conclusion of the Yom Kippur service. “Kapparot is a custom in which the sins of a person are symbolically transferred to a fowl. It is practiced by some Jews shortly before Yom Kippur. First, selections from Isaiah 11:9, Psalms 107:10, 14, and 17-21, and Job 33:23-24 are recited; then a rooster (for a male) or a hen (for a female) is held above the person's head and swung in a circle three times, while the following is spoken: "This is my exchange, my substitute, my atonement; this rooster (or hen) shall go to its death, but I shall go to a good, long life, and to peace." The hope is that the fowl, which is then donated to the poor for food, will take on any misfortune that might otherwise occur to the one who has taken part in the ritual, in punishment for his or her sins. Kapparot is not mentioned in the Torah or in the Talmud. The custom is first discussed by Jewish scholars in the ninth century. They explain that since the Hebrew word gever means both "man" and "rooster", punishment of the bird can be substituted for that of a person. - There is no denying the importance and necessity of a blood atonement, even in Judaism today. - Despite misinterpretation of Hebrew: Sacrifices will continue in the 3rd Temple. 1. To be a physical object lesson that pointed to the coming Messiah and what He would do. It acted as a credit card that covered, did not take away, and rolled back the sin debt until someone, Messiah, could come along and pay it. In the time of the Third Temple the sacrifices will be a reminder of the Messiah who came and what He did (Is. 56, 66; Zech. 14:16-21). The sacrifices that took place before Yahshua came, only pointed to the Messiah which was to come. The sacrifices that will take place after Yahshua, and that will take place in the Millennial Reign, point back to Messiah’s atoning work. 2. It provided and will provide food, materials and income for the Priests and their families (Leviticus 5-10). - The Yom Kippur Sacrifice. During the 3rd Temple it will become a powerful object lesson of what Messiah has done for us. Matthew 5:17 - Came to fulfill, or bring the Torah into its full meaning. - Believe book(s) in heaven are opened and an individual’s fate for the year is decided. - Brake fast with light meal.